As winter approaches, you might feel tooth sensitivity to cold air when you smile. Or maybe you’ve noticed when you take your first sip of hot chocolate or steaming wassail that you feel a sting of discomfort. This is fairly common for adults, and the solution can be simple. Why are my Teeth Sensitive to Extreme Temperatures? If you want a visual representation, check out the ADA’s (American Dental Association) explanatory video here. If you think you’ve got it, let’s move on to prevention and solutions! Pushing harder isn’t brushing better, it can actually worsen the condition, especially if you are using hard bristled toothbrushes. Soft bristles clean better and won’t encourage your gum recession. Also, look at your diet. If you eat large amounts of tomatoes, citrus, or other acidic food, consider cutting back or brushing thoroughly after snacking. 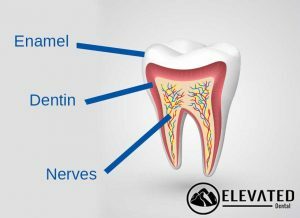 Desensitizing Toothpaste: This toothpaste is packed with some extra potassium, which prevents your nerve endings from being stimulated when they are exposed to hot and cold temperatures. Fluoride Treatment: This is a substance we can apply to your teeth here in the office that can help fortify your enamel so that the hot and cold sensations you experience don’t get to the dentin or nerve endings. If these easy solutions don’t help, talk to your dentist about more involved procedures that can help solve your problem of tooth sensitivity. Don’t keep yourself from smiling in the cold air or refuse a cup of hot cider just because your teeth hurt. These solutions can help you enjoy every part of your holidays!